HONOLULU— In a bipartisan effort to positively impact the cost of living for Hawaii residents, several members of the Hawaii Senate and House of Representatives have filed concurrent resolutions seeking an exemption for Hawaii from a provision in the Merchant Marine Act of 1920 (the Jones Act) requiring that all vessels be built in the United States. The resolutions also ask that Alaska, Guam and Puerto Rico be exempt. 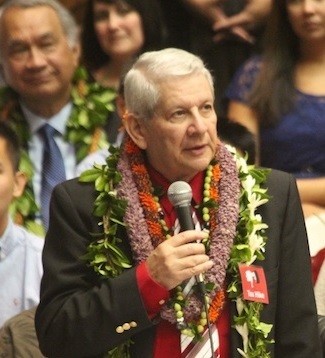 This past Friday, Senator Sam Slom filed concurrent resolutions SR10 and SCR34, co-sponsored by Senators Will Espero, Brickwood Galuteria, Breene Harimoto, Clarence Nishihara, Gilbert Keith-Agaran, Lorraine Inouye, Russell Ruderman and Gil Riviere. The companion resolutions in the House were filed by primary introducers Representatives Sam Kong, Cindy Evans, Lauren Cheape-Matsumoto, Andria Tupola and Gene Ward (HR21 and HCR46). The resolutions urge Congress to exempt Hawaii and other non-contiguous trades from the domestic build requirement because of its restrictive impact on the market for shipping goods to Hawaii.